This dish is a great fresh and spicy option for a starter in summer. Nam Jim dressing is full of classic Thai flavours like lime, chilli and coriander — hot, sour and tangy, it pairs perfectly with these sweet, crunchy coconut prawns and a fresh herbed salad. It is also excellent over grilled meat or fish, or tossed in salads with vermicelli and shredded chicken or pork. Feel free to adjust the fish sauce, sugar and lime juice to taste, and if you don’t want it too spicy, remember to remove the seeds and pith from the chillies before slicing. Toss the shelled, deveined prawns in seasoned flour. Whisk egg white in a small clean bowl and place shredded coconut in another. Dip each floured prawn in egg mixture, then press into the coconut to crumb. Place on a plate and refrigerate until ready to cook. To prepare the salad, thinly slice cucumber and half cherry tomatoes. Tear fresh mint leaves and long sprigs of coriander and toss herbs with the sliced vegetables. For the Nam Jim, roughly chop the chillies, garlic and ginger. Add the coriander. Use a mortar and pestle or blender, and crush until you have a rough paste. Alternatively, chop all as finely as possible. Add sugar in small amounts until dissolved. Add fish sauce and lime juice to taste. Any leftover dressing will last for up to one week in the fridge. Remove the prawns from the fridge. Heat oil in a large frying pan. Cook prawns for two minutes each side or until golden and cooked through. 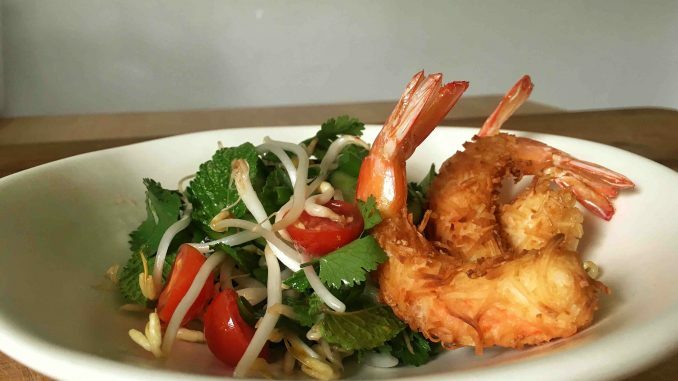 Serve prawns immediately on top of the fresh salad tossed in Nam Jim, or served on the side.